'Conserve food!' The great cry of November was foremost in the settler's mind, because there was no escaping the fear, and the newspaper produced a steady stream of frightening war stories, and announcements of further government-imposed restrictions. Caption: Mary Easter, learning the ways of the west -- to be a good marksman -- near Cabinet, Idaho, circa 1917-18. Courtesy Mary Easter Younkers collection. As an undisputed demonstration of loyalty, area cafes were observing 'Meatless Tuesday' and 'Flourless Wednesday'. Still, the sale of butter and cream, the mainstay of many small farms, was allowed. Clifford Weare not only shipped their butter and cream for families, he drove out to various ranches in his old blue Ford and picked it up, and often brought along small parcels of food when he came to get their products to take to the railhead at Noxon. "England, France, Italy and Belgium, taken together, import in peace time forty percent of their breadstuffs. But now, with their reduction in harvest, they must import sixty per cent. We must increase our normal export surplus of 88,000,000 bushels to 220,000,000 bushels. It can be done in but one-way: by economizing and substituting. "We use now an average of five pounds of wheat flour per person per week. The whole problem will be met if we will substitute one pound of corn or other cereal flour for one pound of wheat flour weekly per person..."
By saving one ounce of meat per person per day we can send our allies what they need; send them butter and milk; send them sugar, the paper exhorted readers. Before December arrived the state administrator announced further restrictions on the use of wheat. Eleven meals each week with no white bread; no white bread for any noonday meal, and no white bread for any meal on Wednesdays and Saturday ... At the present rate of consumption the United States was "unable to feed our allies" until the next harvest.1. Food shortages disrupted the balance of supply and demand. As prices rose, suspicion escalated into animosity toward grocers. The government countered by initiating price ceilings, which the newspaper editor reminded his readers. "Beginning in a few days you will be furnished weekly with a list of wholesale prices (including transportation) and retail prices for your community on sugar, flour, corn meal, rolled oats, butter, ham, bacon, milk, rice and beans. These prices will be put in your hands by the local representatives of the Merchants' Division of the Food Administration... the publication of the facts will tend to remove suspicion and restore confidence between the public and the merchants ..."
Caption: Warren Evans on boxcar load of their hand-split cedar posts, on the Northern Pacific Railroad loading spur at Noxon, Montana. Brother, Walter, is with the team and post wgon. Courtesy Edna Evans Cummings collection. Chess and Alzire Greer's barn. 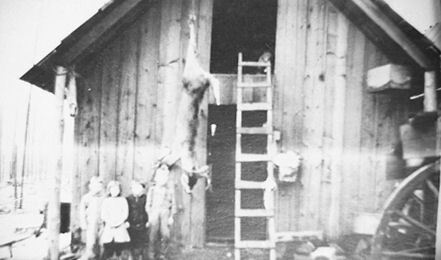 Left to right: Blanche Gordon, Loren King, George Gardner, Granville 'Skinny' Bauer, with deer. Courtesy Clayton Bauer collection. Caption: Chess and Alzire Greer's barn. Left to right: Blance Gordon, Loren King, George Garner, Granvill 'Skinny' Bauer, with deer. Courtesy Clayton Bauer collection. Even while lack of cash forced farmer's taxes to go delinquent again, and co-operation, by marketing posts direct through the county agent instead of the local stores looked like it might help. And while politics were souring friendships between many settlers, housewives were devising new recipes to sweeten the Christmas holidays. Sugar was rationed to 36 pounds per year per person. They brought out fruit cakes, baked months earlier, carefully wrapped in cloths soaked in wine or fruit juice, and stored in the root cellar. The old method (fruit cake) called for 2 eggs. Their patriotism could go unchallenged as they sought to assure neighbors and friends that the new recipe tasted almost as good as the old. DIRECTION: Put the first eight ingredients into saucepan and boil three minutes. When cool, add the flour and baking powder, which have been sifted together; mix well. Bake in moderate over in loaf pan (round tin with hole in center is best) for 35-40 minutes. Ice with white icing.*2. Caption: Roy and Leslie Raynor at Noxon, Montana. Courtesy Edna Evans Cummings collection. Dr. Price's cream baking powder boasted it was made from cream of tartar, derived from grapes and contained no alum or phosphate. As food became scarcer, restrictions heightened and penalties were added for disobeying them. "The punishment for hoarding necessities is a fine not exceeding $5,000 or imprisonment for not more than two years or both."*3. What defined hoarding? Sanders County Independent Ledger explained the rules in January 1918 issues of the paper. Hoarding meant having a quantity in excess of reasonable requirements for use within a reasonable time. This was interpreted to mean two weeks in ordinary cases, the settlers learned, as the newspaper embellished the latest information in nearly every weekly issue. "With the increasing watchfulness of the administration and its improved facilities for checking up the hoarders, the danger of being detected is greater every day."*4. Soon, the 'Victory' loaf was devised - bread made with 30 percent of cereal flour other than white flour. It was hated. Regardless how good the homemaker might be at baking, such restrictions would make welcome any new recipes that became available, and the newspaper printed one after the other. "OAT FLOUR BREAD. Into one-quart Mason jar put one pint of warm unsalted potato water. Add three rounded tablespoonfuls of sugar and one cake of Yeast Foam, which has been soaked in one-half cup of lukewarm water. Set in moderately warm place for three days to allow yeast to work. This completes the starter, which should now be kept in a cool place until ready to use. "When ready to use the starter add three rounded tablespoonfuls of sugar and enough warm unsalted potato water to fill the jar, at six p.m. Set the cover on the jar (do not screw it) and place jar in a warm place. This will be foamy when ready to use. "OAT FLOUR BREAD WITH STARTER. 1 pint starter 2 1/2 cups boiling water 2 cups oat flour 6 cups wheat flour (measure before sifting) 2 tablespoonfuls lard 1/4 cup sugar 1 level tablespoonful salt. Pour the 2 1/2 cups boiling water over the oat flour, stirring until smooth. When lukewarm add shortening, sugar and starter. Add the wheat flour gradually and knead well. Set in moderately warm place to raise over night. In the morning mould into loaves, crease well and let raise until double in size and bake in the usual way. One-half cup of chopped nuts may be added if desired. It is well to mix the bread about 9:00 p.m. or later.*5. "CORN BREAD WITH RYE FLOUR. 1 cup corn meal 1 cup rye flour 2 tablespoons sugar 5 teaspoons Dr. Price's Baking Powder 1 teaspoon salt 1 cup milk 1 egg 2 tablespoons shortening Barley flour or oat flour may be used instead of rye flour with equally good results. Sift dry ingredients into bowl; add milk, beaten egg and melted shortening. Stir well. Put into greased pan, allow to stand in warm place 20-25 minutes and bake in moderate oven 40-45 minutes."*6. Caption: Katherine Newlon and the char her kitten wants. Circa 1917-'18. Courtesy Mary Easter Younker collection. Foods supplies were expected to be a serious problem if the war continued for another year. Kansas, which usually produced one-seventh to one-fifth of the nation's wheat annually, was expected to not be able to produce, "with favorable weather henceforth", more than a 50 percent crop at best. 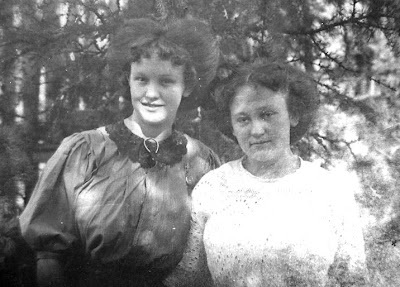 Fred and Annie Allan's daughters, Christie and Lucy favored the Gibson Girl fashions of their day, circa 1914. Courtesy Agnes Jenkins Hampton collection. ﻿With expanding families to feed and directives to grow gardens for the war effort, producing a good garden showed patriotism. People tried every method they heard of to increase production. Clifford Weare raised nice big gardens in his plot near where the fur traders used to camp (on the old Freeman place). While they were gardening there one year the Weare children found a bronze mortar - the kind used for making medicines. But they never found the pestle. Caption: Elizabeth Jane and Millicent Evans, Thomas Evans' daughters. Courtesy Edna Evans Cummings collection. Cliff decided his garden would be better if he fertilized. So he set his children the task of collecting horse urine. "Papa rigged up two long sticks with a five gallon can attached to each," his daughter Freda recalled. "He told us kids to put it beneath the horses when they were ready to urinate. '"Catch the pee,' he said. "Of course when the horse heard this sharp tinny noise, he'd stop! But eventually we accumulated and dumped enough into the big wooden barrel by the garden that the day arrived to saturate the garden with it. This would give us a bumper crop, Papa said." "Every cabbage plant we had that year died from it."8. Caption: Clifford A. 'Buster' Weare with his pet white cat on the shoreline of the Clark's Fork River near Noxon, Montana. Circa 1912. Clifford A was the first school bus driver on the Bull River schoolbus route in 1936. Courtesy C. A, Weare collection.Weare told of another gardening escapade. "Oh, I had potatoes and cabbage and I put in onion sets," he said. "And I put in cucumbers, too. When Buster was a little tyke he went out and pulled all the cucumbers. I see his tracks go around among them where he pulled them all up. They were just commenced to blossom, you know. "I said, 'Well who did?' "'Marian,' Buster answered. "He began to cry then. 'I was lookin for cucumbers.' "Haha. He thought they grew underneath. Hahaha. That was so cute that I didn't say nothin more."9. (insert photos)Caption: Brothers, Billy (left) and Tommy Ellis, riding their aunt, Nettie Ellis' horse, Daisy, at Noxon, Montana 1913. Courtesy Charles Ellis collection. (iinsert photo)Caption: Successful fisherwomen posing with their catch from the Clark's Fork River. Mary, Bernice and Katie Easter at their new 'stump-ranch-home' near Cabinet, Idaho, circa 1917. Courtesy Mary Easter Younker collection. "New food cards will be issued to the housewives of Montana as soon as the railway congestion is relieved... Not more than 49 pounds to customers in town, and not more than 98 pounds to customers in the country." "Not more than 10 pounds (sugar) to customers in town or close to town; not more than 25 pounds to customers living some distance from town; not more than one week's supply to hotels and restaurants using more than 25 pounds per week. "It is understood that dealers will use their judgment in supplying ranchers and others who cannot get to town for long periods during the winter ... dealers are authorized to increase these amounts in such instances." "this year's entire wheat crop, if necessary, in order to conserve the supply of food for America's fighting forces and the armies of America's allies, and reduce the cost to consumers in the United States." The nation was urged repeatedly to conserve food.*12. "Wheat is scarce. And growing scarcer." Caption: Lucy Allan Jenkins with baby son, Robert, 1922. Courtesy Loren Jamison collection. "exercise complete control over this year's harvest through the powers conferred on Administrator Hoover in the food and export control law." When a federal grain control board was created to "supervise the distribution of wheat and the manufacture and sale of flour..." alarm raced through Noxon. Crops that could not be grown in the cool mountain valleys had to be gotten from beyond the valley. Their survival was dependent on shipping in supplies of foodstuffs in quantity. Flour was one of the staples of existence. It wasn't so long since the Civil War that stories of starvation among the grandparents of some were still vivid. Prices were high, to be sure, but fear, as much as anything, prompted the people to act. 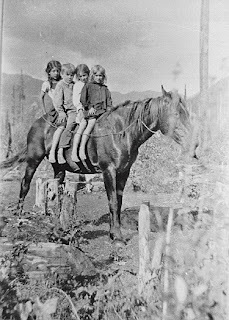 Caption: Children on outing to Cabinet Gorge on the Clark's Fork River near Idaho-Montana border. Circa 1917-'18. Courtesy Mary Easter Younkers collection. Noxon was a small microcosm of changes in America. Its people differed from many other states because of the great settlement era of railroading and settlement that had brought them far from homes and relatives during a relatively short span of years. Settlement had only began in the region after the arrival of the Northern Pacific Railroad in 1883. There was scant need for government, other than 'vigilante' action to expel the worst criminals. Transportation and schools were the high priorities, other than the US Forest Service control of the timber harvesting. "every shade of radical opinion of the period represented: Socialists, syndicalists, labor agitators, and direct actionists, plus a saving number who believed in the beneficent possibilities in the gradual development of consumer coops." A look at the origins of some of the originators shows strong Russian roots. Hyma Cohn, born in Russia, 1879, in 1909 was president of a group incorporated as Coop League. It dissolved in 1914, but he was not discouraged that it was a viable "means of solving economic problems." He espoused "Rochdale principals" that the moral force of the Golden Rule and the Sermon on the Mount can only work through consumers' cooperation. M. Fainberg, Russian born 1897, writing in U. S. journals with descriptions of credit coops in Russia and the beginnings of coops there; became the director of Coop League USA 1918-'20. Charles Folda, Dillonvale, Oh, born February 7, 1893 in Czechoslovakia, and K.E. 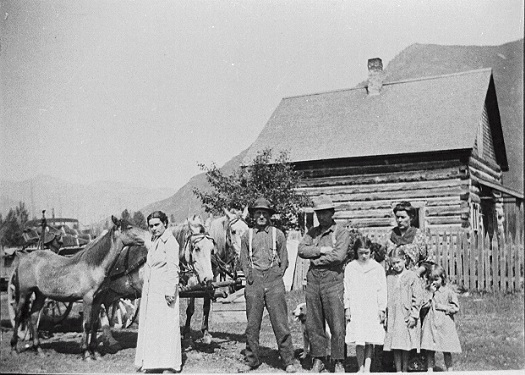 Grandahl, born in Finland 1882, who attended the University of Montana, later became the bookkeeper of the Red Lodge, Montana coop. Jerry Voorhis became the executive director. Coop League USA director, C. Edward Behre, born in Brooklyn, NY, later Associate Professor, University of Idaho, School of Forestry, 1919-'23 and director of Northeastern Forest Experiment Station 1923-'42 before advancing to Staff Consultant, USFS in Washington, DC until 1955. Mabel Watson Cheel, Secretary of the League, traveled coast-to-coast 1917-'20 organizing, speaking, getting coops started; became a director and treasurer. James A. Duncan, was born in Scotland, went to sea, became a marine engineer, arrived in US 1904; Director 1921-'22, Seattle. Believed pay as you go, and watchdog on public purse. The Coop movement believed that people should come together, establish their own grocery store, buy their own groceries through it, and divide the profit among themselves in proportion to their purchases. In 3 years Foernsler divided $4,000. Politics tried to enter and disrupt it. Fights prevented its encroachment and communists were expelled from membership in 1930. State legislatures often fought establishment of coops. Coops advocated that people should rely chiefly on cooperation and other voluntary, self-help measures to solve their economic problems, and not rely on the government. "Larson's store and Buck's Store was charging $3.10 for a 50 pound sack of flour," Weare said. "So the settlers got together. They felt it was worth $1.55 and that the store keepers were doubling their money on it." Cliff Weare and O. C. Metheny, the NP railroad depot agent, discussed the problem, deciding to order a carload of flour and feed, if they could interest others. "I went and schemed with different fellows, collecting $900 that day to get up a car of flour and feed," Weare said. Weare was highly pleased with the success of his mission. Not the least of his pleasure was derived from his belief that he would deal his old foes, Larson and Buck, a blow. "Then Metheny said they'd just raised the minimum weight for freighting on the railroad from 20,000 to 30,000 pounds. We'd have to pay for 30,000 pounds whether we used it or not. "Earl Engle was in our meeting, too. So he went over and told George Buck, the storekeeper, we couldn't get that flour and feed because we didn't have money enough and the railroad had raised the minimum on the railroad car. "Buck, he run over and told Henry Larson, the other store owner in Noxon. And of course Larson had to tell everybody else! So I got in my old blue Ford car and went up Bull River." Weare stopped in to talk to every settler, promoting the organization of a cooperative store. Where no money was immediately available to become a stockholder, pledges were given to become one. He was a good talker. He also was a member of the Cooperative League of America. He didn't mind swinging others to the political beliefs he held. But for now he was content that a cooperative store was forming.
" I raised about $800 more. Then we got the boxcar of flour and feed," Weare said. "We didn't have quite enough so I took about an extra ton of flour myself."13. "That building where Mrs. Baxter had the hotel, we put a store in there," Weare said. "That was in 1918." The People's Commercial Company settled into Lena Baxter's hotel, and soon began giving stiff competition to Buck's, Hayes' and Larson's general merchandise stores. Harry Tallmadge ran the coop store first for a salary of $125 a month, plus the lofty title of Business Manager. This store is typical of general merchandise stores of the era, including the cooperative store Harry Tallmadge worked in at Noxon. Courtesy Harrry and Sarah Tallmadge collection. ﻿Weare had convinced the board of directors that the personable and energetic young fellow, who had already passed the examinations that qualified him for forest ranger, was the right man for the job. But, William Held, who didn't like Harry was against the selection from the start. On May 12, 1919 Chairman W. F. Held called the meeting of the Board of Directors together at 2 o'clock p.m. The bylaws were read and discussed, some changes made. Jim Saint motioned their adoption as re-read. Louis Wagner seconded the motion. It carried unanimously. Henceforth a board of directors would run the Peoples Commercial Company. When the meeting adjourned four hours later it was neigh on to dinnertime. Jim C. Saint had been elected president. Eighty-eight votes had been cast. Saint received 16, J. C. Colvin - 15, L. G. Wagner - 11, C. R. Weare - 9, Chas. Fulks - 9, W. J. Higgins - 8, Harry Wilson and Urie Ellis - 7 each, and one of the two women members, Ethel Weare - 6 votes. Ethel's mother, Lena Baxter, was the only other woman member of the cooperative. Louis Wagner was elected first vice president; Harlan J. Higgins second vice president. William Held beat out Harry Wilson for secretary; Earl Engle won over Charles Fulks for treasurer. Conclusion of a discussion about a permanent business location resulted in Colvin making a motion they buy the present location. Wilson seconded it. Motion carried. The business got off to a good start with fifty-six stockholding members. Only James C. (Coley) Colvin attended every meeting of the co-operative from its inception. William Held missed only one meeting. Clifford Weare and Louis G. Wagner were absent twice. Ethel Weare, Albert Sanda and William (Bill) Higgins were also prone to keeping their eye on the business. They voiced their opinions at all but three or four meetings. Co-operativism was the guiding force at the beginning, but disagreements arose immediately. Eight members never attended any meetings. Twenty-eight attended five or less, many of them coming only once. A few more gave it a second go round, some even a third. Wagner, John Francis McKay, Wm. Held and Cliff Weare shared Socilalistic ideologies, and subscribed to Socialist publications, thereby inspiring further animosity from the other businessmen in town. On June 6, members voted to pay $100 a month to the First State Bank, Thompson Falls, Montana, on a loan to buy the building site. , A lot on the west side of Hayes' store, on the southwest corner of the street leading to the Hotel Montana had been agreed on for a new location. Plans were made to build their own store building. Mrs. Legault was to be allowed $250, subject to adjustment, for lumber already used for the new building. It would be two stories high with a flat roof. Caption: Northern Pacific Railroad Assistant Maintainer and hiw wife, 1917, at Cabinet, idaho ranch with the char they caught in the Clark's Fork River. Courtesy Mary Easter Younkers collection. Weare reported that the Heron meeting to promote sale of stock was unsuccessful because bad weather had kept people from attending it. Stockholders offered to lend $1,500 operating money rather than have the corporation borrowing from the bank. It was decided not to let credit to anyone longer than fifteen days; $50 maximum. The third Saturday of each month was set as Board of Directors meeting date. Members who failed to attend regular stockholders meetings would be fined $1.00. The only acceptable excuses would be absence due to being busy with government work (forest service) or illness. The secretary was instructed to write to all subscribers of stock to settle up for their stock by the next regular meeting.14.In July, the secretary of the Peoples Commercial Company, Inc. was again writing to those stock subscribers who failed to respond to the last request to settle for their stock. In addition the Board of Directors would personally interview each one. The members present also approved issuance of an indefinite amount of $10 and $50, five year, 6% bonds, and then declared that the company officers were to be bonded at $1,000 each. Assets were $6,075, liabilities, $4,600. Permission was given to borrow $2,000, from any bank or individual, for business use. 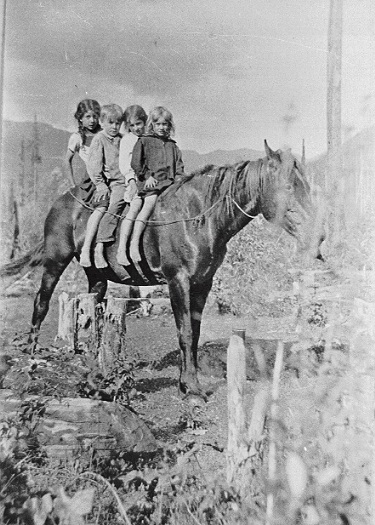 Kids on a pony in Bull River valley, circa 1910. Stella Gordon in back and Grace Gordon in front. ﻿ The new building was built. William Fulks was hired at $3.00 a day, as assistant manager until the move into the new building was completed. Mrs. Baxter was paid the $60 rent owed to her. A social dance and house warming in the new building was planned for July 12.15.Only two items of note were decided at the August meeting of the Peoples Commercial Company, Inc. One was to be crucial to their existence: Sixteen hundred dollars worth of fire insurance was purchased on the building; $200 on fixtures, $2,000 on stock. A motion that all ranch products be handled by the store on only a 5% commission basis and products of members at all times be given preference was defeated. "We did a big business," Weare said. "I run it for a year. We only started in with $900. I turned it over to Harry. We had $500 in the bank. Our profit was 10%. When I turned it over to Harry we took an invoice and we had $1,500. $1,400 and some dollars, almost $1,500 of groceries, and $500 in the bank at Thompson Falls. "Harry ordered a big bill of goods. Oh, more stuff than he needed, and he hadn't got it over to the store [the new building] yet and it burned up. Only thing he had over there was the salt." Before the move into the new building was completed, a fire destroyed Mrs. Baxter's hotel and the cooperative's entire inventory. "He ordered a ton of salt. And they didn't need a ton of salt, you know," Weare said.16. "They got pretty mad that we was doing all the business in town. So either Larson or Buck set it afire one night. Set it on the outside. "Harry Talmadge was running it then. We put Harry in there to run it. Somebody went over, I don't remember now who it was, went over to the depot to get the fire extinguisher. It was just a little fire on the outside. "A woman, Wilcox, was operator there. Well, she says, 'I'll have to ask the dispatcher first.' Well by the time she asked the dispatcher, and, God, the fire was going. And it was too late. And it burnt up. "Harry had just went in there, too. And he'd put in $1,500 worth of goods that day. He had everything over into the store [in Mrs. Baxter's] except for that ton of salt he had over in the depot. Hahaha. That's what we had left. Yeah..."17. Suspicions were abundant. Did one or more of their competitors set the fire? Was it an attempt to squelch the Cooperative League of America as a political entity? Had the fire been set to collect insurance on an aging hotel building? No charges were ever filed. Mrs. Baxter's attorney, Ainsworth, submitted a claim for $400 loss due to the burning of her building. 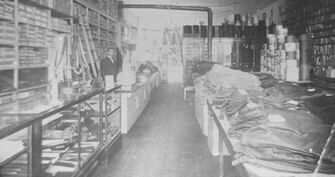 ﻿ ﻿The People's Commercial Company store opened business in their newly built quarters, which were about the same size as the mercantile store at the other end of Main Street. October 4th, they decided to vote themselves some profit on their investment. Commencing January 1, 1920 the board of directors would be empowered to declare and pay a dividend, not to exceed 5% per annum, on all paid up capital stock before any trade dividends were paid. "Harry run it into the ground. I had to take it over again. I went back and then this fellow, oh, what was his name ... Held." Caption: Northwestern Montana homesteader's kids on Bull River, out for a little target practice; a favorite pasttime while developing skills necessary to survival. This is one of Essie Thomson Mercer's unidentified photos. Courtesy Ruth Mercer McBee collection. May 12, 1919 members of The Peoples Store included: James C. Saint, Louis G. Wagner, Harlan J. Higgins, Wm F. Held, Earl Engle, Granville J. Gordon, Ben F. Saint, Clifford R. Weare, James C. Colvin, Harry V. Tallmadge, Everett Jenkins, Albert Sanda, Oscar E. Kutter, Ethel M. Weare, Charles Fulks, Wm. J. Higgins, John F. McKay, Dan Coan, U. E. Ellis, York Lyons, Wm. Ellis, James Freeman, Chester A. Greer, J. W. Skelton, Harry Wilson, H. J. Beal, Wm. C. Meadows, John Fulks, James Moore, Al Gordon, George Jamison, Lena Baxter, A. E. Byers, Leon Rhoades, Don Maynard, Jas. Miller, Earl Lockman, Thos. Moonan, Isac Engle, Fred Koppe, P. H. Scheffler, I. B. Bartholomew, W. H. Manicke, H. A. Harris, Frank Berray, W. M. DeLano, J. W. Burdett, Jas. A. Berray, C. E. Kirschbaum, John Pilik, E. E. Doerschuk, Alex Orr, Wm. Geske, L. Loveland, Jas. Brockway, and W. R. Brady. Harry and Sarah Tallmadge moved up Bull River, considering themselves well out of the hassles of the store business. Mrs. Baxter settled her claim against the corporation for the burned hotel, receiving a lifetime paid up membership, all rent which had been paid and the balance of $300 to be paid to Frank Lyons, crediting her on a lumber bill due him. The corporation also decided to buy a heating stove for the store. When Forest Ranger Ben Saint presented a bill of $400 due on the note covering part of the Forest Service account, Colvin motioned to defer payment for thirty days and instruct Saint and secretary William Held to go over all forest service accounts. All corporation accounts had been audited the end of September. The audit was accepted. The store had bought an adding machine, paying for it at $10.33 installments. Again they discussed the advantages of joining the Cooperative League of America. but took no action on it. The People's store decided to use the old ice house and possibly get the use of Ellinwood's warehouse for storing hay. They'd shipped a carload of posts to Ray Bros. Payment hadn't arrived. They would secure the shipping bill from the railroad station agent and send a demand for immediate payment to Rays Bros.19. Sanders County Independent Ledger, April 1917. Sanders County Independent Ledger, July 14, 1918. Freda Weare, oral history, 1973. Guy Engle homestead papers: Albert Peterson, the Noxon resident who witnessed Engle's homestead papers, lived only five miles away, seeing Guy Engle only 4-5 times each year. Peterson reported the following progress, August 28, 1912, to Assistant Ranger Granville Gordon. (1906) Cleared one acre. None cultivated; (1907) 2 acres cleared. l cultivated, planted 30 fruit trees; raised 100# spuds; l bushel turnips; 1 bushel carrots; planted 500 strawberries. (1908) Three acres cleared, 1 cultivated; raised 200# spuds, 50 quarts strawberries, 2 bushels rutabagas. (1909) 4 acres cleared, 400# spuds, 50 quarts strawberries. (1912) 6 acres cleared, 1 acre cultivated; 1,000# spuds, 300# turnips; 200# rutabagas, 3 acres seeded to hay. Government food commodity prices- Bacon, $4.15 per can 17 pounds; corned beef, 55 cents for can of 1.36 pounds; baked beans, 5 cents for can of 1.25 pounds; sweet corn, 10 cents for 2.25 pounds can; dried beans, $6.49 per 100 pounds; crackers, five and six cents a pound; army flour, $5 per 100 pounds; macaroni, seven cents per 1.5 pounds; rolled oats, 12 cents per 2 pounds; seeded raisins, 10 cents per pound; rice, $6.74 per 100 pounds; tomatoes, 9 cents per 2 pound can; and corn meal, $3.50 per 100 pounds. Peoples Commercial Company Corporation journal pages 1-4. Peoples Commercial Company Corporation journal pages 5-7. Clifford R. Weare, tape recorded oral history March 10, 1970. People's Commercial Store, Peoples Commercial Company Corporation journal. Page 17, Peoples Commercial Company Corporation journal.